The Tomato Clownfish is one of the most popular saltwater fish. The world loves a clown and every reef tank deserves one. But, since it is best to only keep one clownfish species in a tank, how should you decide if this is there right species for you? This guide covers what it takes to care for a tomato clownfish in a reef tank and shares the pros and cons to expect if you do. The scientific name of the Tomato Clownfish (TC) is Amphiprion frenatus. Other common names you might find them labeled as, regionally, include the Red Clownfish or Bridled Clownfish. Whatever you prefer to call it (please don’t call it Nemo), this pretty fish is sure to add color and personality to your aquarium for many years to come. The iconic tomato clownfish has a single large white band just behind the eye. The fish is very hardy. They eat live, frozen and prepared foods with gusto, are tolerant of water conditions and are bold/active inside the aquarium glass. That makes them a reasonably good choice for a first-time aquarium owner or anyone who is looking for an alternative to the ubiquitous common clownfish. TC’s are primarily native to the Western Pacific but can be found on tropical reefs in other parts of the Pacific Ocean, where they are most commonly found swimming among the tentacles of a bubble tip anemone or Adhesive anemone, Cryptodendrum adhaesivum. Like most of the other clownfish species, the tomato clownfish doesn’t need a lot of room to roam about, because they are relatively site attached. They will establish a territory or home and spend most of their time there. However, since they are relatively larger than common, percula and skunk clowns, they do require a bit more space. You could probably maintain a breeding pair in a dedicated 20-gallon tank. But if you want to add them to a community tank, it would be wise to add them to a habitat that is at least 40 gallons (~150 liters) in volume. Once a pair does establish ‘their’ territory in ‘your’ tank, you would be advised to keep your hands and arms out of the way, or you risk getting a nice nip from your local neighborhood fishy friend. What I love most about these fish (in addition to the awesome white stripe on their heads), is that they are nearly bulletproof in a saltwater aquarium. With basic saltwater aquarium water parameters, the fish will be fine. It has been reported that TC’s will breed with other similar species–known as members of the “Tomato complex”, which sounds a bit more like a psychiatric disorder where you always think that tomatoes are out to get you. You and I both know…they are out to get you. The most common of these species (around here at least) is A. melanopus, the Cinnamon clownfish. Outside of the special and likely rare situation where you would want to create a hybrid pair, it is best NOT to mix two species of clownfishes together or even damselfish species (which are also closely related). Beyond that, TC’s are largely compatible with many other saltwater fish, as long as the other fish are not notoriously aggressive or dangerous to clowns, like triggerfish, eels, groupers, lionfish, etc. You also might want to avoid keeping them with super-shy fish species that might not be able to compete for food with this large clown that may even seem like they are begging for food. Like all other clownfish, TC’s are hermaphroditic, which means they have both male and female reproductive organs. Juvenile fish first become male. The largest, dominant male will then change gender and become female if the resident female dies or leaves. 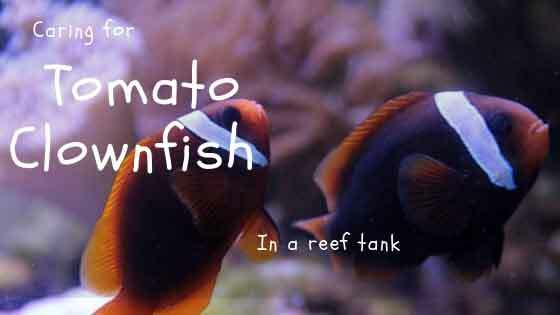 Tomato Clownfish are omnivores. They will eat anything from live food, frozen food, and even flake food. A tomato clownfish in a saltwater aquarium can be expected to live anywhere from ~1-2 years on the short-side to ~15+ on the longer side. It is important to pick the species you really want. In her book, Clownfishes, Joyce Wilkerson conservatively reports that tomato clowns can grow to be 4 inches or more. Other sources online reference either 5 inches or 5 1/2 as the maximum size. Like most (all?) of the other clownfish species, female A. frenatus are larger than male. For more information about caring for this or any clownfish species, I recommend you pick up this book. Do you have experience with this fish? Or perhaps you selected a different clownfish species instead? Please leave a comment below and let us know what you think about this fish.